Sport Fishing of Sharks research papers discuss overfishing in sport fishing in the Atlantic Ocean. Ecologists and environmentalists warnings are becoming increasingly strident as sport fishing has led to habitat destruction of Sharks and wanton waste take their toll on the Atlantic Ocean. Concervation efforts have helped. This is in part due to the majority of shark sport fishing tournaments and competitions changing to tag and release instead of keeping the shark for trophy purposes. Tag and release programs have served to track sharks throughout the Atlantic and monitor their decline. 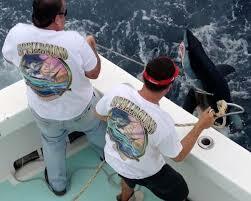 Sport fishing enthusiasts point to many attempts to control shark predator populations at the request of anglers. Many of these attempts have yielded valuable ecological insights. However, the fact remains, from the obvious problem of overfishing to the more exotic and lesser known conundrum of the popularity of shark fin soup, the Atlantic shark faces threats to its population that have sited a decrease by some estimates as much as 5 to 6 percent a year. Explore this science term paper Sport fishing of Sharks further. Paper Masters writes custom research papers on Sport Fishing of Sharks and discuss overfishing in sport fishing in the Atlantic Ocean.